If information and other material from this proceeding are used the following reference should be given: Proceedings of the 2nd International Workshop on Oil Depletion, Paris, France, May 26-27 2003, Edited by K. Aleklett, C. Campbell, and J. Meyer. ….The uh, I think basically that now, that peaking of oil will never be accurately predicted until after the fact. But the event will occur, and my analysis is leaning me more by the month, the worry that peaking is at hand; not years away. If it turns out I’m wrong, then I’m wrong. But if I’m right, the unforeseen consequences are devastating. But unfortunately, the world has no Plan B if I’m right. The facts are too serious to ignore. Sadly the pessimist-optimist debate started too late. The Club of Rome humanists were right to raise the ‘Limits to Growth’ issues in the late 1960’s. When they raised these issues, they were talking about a time frame of 2050 to 2070. Then time was on the side of preparing Plan B. They like Dr. Hubbert got to be seen as Chicken Little or the Boy Who Cried, Wolf…. Matthew Simmons has been a key advisor to the Bush Administration, Vice President Cheney’s 2001 Energy Task Force and the Council on Foreign Relations. An energy investment banker, Simmons is the CEO of Simmons and Co. International, handling an investment portfolio of approximately $56 billion. He has served previously on the faculty of Harvard Business School. [Regarding peak energy] It might turn out actually to be one of the most important topics for the well being of the globe over the next fifty years, which basically (is), “Is the energy glass half full or half empty?” So let me, in the course of the next thirty or forty minutes, just share some of the issues that I think are important. But the real issue is, basically speaking, does not mean running dry. The debate on how long the dwindling of supplies might take has been extremely controversial. In fact, I’d say that most of the debate has been one-sided. Optimists argue that the issue is still years away, and to their support is that it has never happened before and it’s too often been predicted. And each time the future looks bleak, the optimists argue, it’s always darkest before dawn. It is also interesting how many people look at undiscovered reserves and say that we don’t know how much we still have left to find, and that’s true, but we also, with the evidence of the reserves, there’s no guarantee that the reserves are there. I come back to the basics and say I think that one thing that we do all know is that oil and gas resources are genuinely non-renewable and so someday they will run out. And also, we are using 28 billion barrels a year, that’s a lot of energy to be consuming. And peaking, as you all know, is different than running out. Is “peaking” an important question or issue? First of all, if you start out by saying usable energy is the world’s most critical resource then obviously it is an important issue. Without volume energy we have no sustainable water, we have no sustainable food, we now have no sustainable healthcare. And since five-sixths of the world still barely uses any energy it is an important issue. And since five-sixths of the world is still growing fast or too fast it’s even a more important issue. What peaking does mean, in energy terms, is that once you’ve peaked, further growth in supply is over. Peaking is, also, a relatively quick transition to a relatively serious decline at least on a basin by basin basis. And the issue then is the world’s biggest serious question. Peaking of oil is also probably then assuming peaking of gas too. So is this issue important, I think the answer is an emphatic yes. Why does this issue evoke such controversy? Well, I think for several reasons, first of all, the term “peaking,” unfortunately, does suggest a bleak future. It also suggests high future energy prices and neither are pleasant thoughts. I think it is human nature to say that we like to have pleasant thoughts. And crying wolf is bad business unless the wolf turns out to be already at the front door, and by then, the cry is too late. And crises are problems, by definition, that got ignored. And all great crises were ignored until it became too late to do anything about it. And so if the issue is serious, why are the answers so dissenting. I think the reasons are several-fold. First of all, the data and the methodology to estimate total energy resources is still remarkably hazy and takes a lot of fuzzy logic to get to the bottom line. Judging the data, for instance, on current decline rates on even fields per basin is very hard to define, and it turns out that peaking is one of these fuzzy events that you only know clearly when you see it through a rear view mirror, and by then an alternate resolution is too late. Over the course of the last few years, conventional wisdom in the energy business became “do not trust conventional wisdom.” The voice of energy, for better or worse turns out to be the International Association of Energy Economists and I will be attending this group’s 26th annual meeting next week in Prague. This group had a mantra throughout the decade of the nineties that growth in energy demand is suspect, that energy supplies are surging, that Moore’s Law has brought down semiconductors at a cost so dramatically it will bring energy prices considerably lower, that OPEC is obsolete, and a non-sustainable concept. Last year, the IAEE had their 25th annual meeting in Aberdeen, and I attended the program. It was really interesting. On Saturday morning, they had 13 of the past 25 presidents talking for the better part of two hours and individually reflecting on the lessons that they had learned over the past 25 years. And I heard 13 consecutive people state…what I heard most, was the word, “conventional wisdom.” This was the big mistake I made 25 years ago. Twenty-five years ago, I thought demand was going to go up fast and that was wrong, I thought that oil prices were going to 100, and that was wrong, and I thought the OPEC was omnipotent, and that was wrong, and I thought that supplies basically were going to be a pot of gold and that was wrong, and what I learned personally is never to trust “conventional wisdom.” And by the time all thirteen speakers had spoken, it was clear that their belief had become conventional wisdom. It turned out that the generals, as happens so often in the military, were fighting the last war. The big energy mistake that was made, circa 1980-1981, was that oil was going to go to 100, was that the demand growth was insatiable and that OPEC was omnipotent. And what all these people missed at the time was that the oil prices had already grown tenfold; that nuclear energy was at the front door, that the fear of a hundred dollar oil had finally created a conservational efficiency move and that a ten-year E.P. [environmental protection movement] movement created a surplus glut. And preventing making this mistake again became public enemy number one and led a generation of energy experts to mistrust demand, to assume supply growth and just to know that price collapse was just around the door, the corner. But it is interesting now with the benefits of being in a new millennium, to look back and see what happened to oil demand over the last 30 years. First of all, global oil demand did fall in 1974 and a half way through 1975. But over the course of the first eight years of the 1970’s, global oil demand grew significantly. Global oil demand then fell in 1979 through 1983. And so you had five of thirteen years down, but the two events that caused this down demand were a tenfold increase in product and the introduction of the only new energy source native to the 20th century; nuclear. Global oil demand began to grow again in 1983. The collapse of the F.S.U. from 1988 to 1995 created the illusion of global stagnation while the rest of the world’s oil demand and energy just grew and grew and grew. And it’s interesting to step back and look at the difference between 1986 when non-FSU oil demand was just under 54 million barrels a day, to 2002, when we crossed 73 million barrels a day, a 21 million barrel a day change during an era that people thought basically that demand growth was over. And then let’s turn briefly to what happened to the world’s supply. Well, first the former Soviet Union supply collapsed. Secondly, the North Sea had its second boom. Third, deep water became the new frontier and probably the last frontier, and fourth, OPEC remained the swing producer. If you look at the non-OPEC numbers excluding the former Soviet Union, you have a growth between ’86 and 2002 of 8.3 million barrels a day. Now it’s interesting to see that global oil growth and demand was 20 and non-OPEC non-FSU growth was 8.3. But if you look carefully at the 8.3, in the first ten years, ’86 thru ’96, during an era of low oil prices, we grew by 6.7 million barrels a day, and in the last six years, during the era of high oil prices, we grew by 1.5 million barrels a day. So 81% of the last fifteen years growth, came in the, sixteen years growth, came during the era of low prices, and 19% came during the era of high prices. It turns out with just hindsight that we can now clearly see that the growth engine of non-OPEC oil, excluding the former Soviet Union petered out. The North Sea peaked, Latin America excluding Brazil peaked, North America, excluding heavy oil, peaked, Africa excluding deep water peaked, the middle east excluding OPEC peaked, and the F.S.U turned out the be the only lasting pleasant surprise. Which then raises the following question: Was the F.S.U recovery real and sustainable? 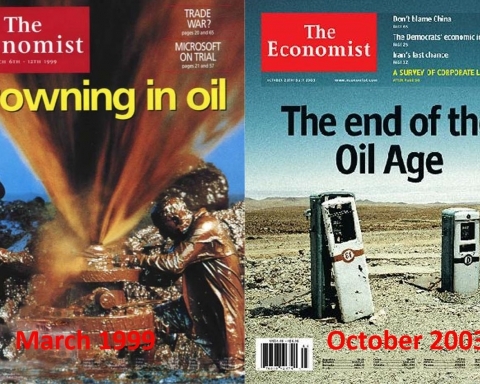 In 1998-1999 not a single oil expert assumed that the F.S.U. would suddenly turn around and start creating supplies again. But then low oil prices created through the saga of the missing barrels caused the Ruble to collapse. And subsequently, high oil prices created an F.S.U bonanza, low global prices, and unbelievably high revenues. 67% of the 2000-2003 non-OPEC supply came with the F.S.U.’s oil recovery. Some of this increase was unlikely due to bad data, and some of the increase was a one-time gain. There has been no significant FSU exploration yet. It’s simply too expensive. And logistical bottlenecks create some significant limits to further export growth. So I think it’s dangerous to assume that the FSU growth will continue. In the meantime the cost to create new oil supply soared. While conventional wisdom believes where there’s a will there’s supply, real costs to maintaining flattening supplies soared. Between 1996 and 1999, the 145 Public E&P companies which were worldwide, spent 410 Billion Dollars to merely keep their full production flat at about 30 Million barrels of oil per day. The Big Five, Exxon, Shell, BP, ChevronTexaco, and Total spent 150 Billion dollars between 1999 and 2002 to barely grow production from 16 billion barrels of oil a day to about 16.6. The Big Four, excluding Total, because their numbers weren’t out yet, between the first quarter of 2002 and the first quarter of 2003 went from 14 million, 611 thousand barrels of oil equivalent per day to 14 billion 544. These four companies spent collectively over 40 billion dollars over a 12 month period actually lost 67 thousand barrels a day of total production. So while people were assuming costs would fall the cost to stay in the game went through the roof. One of the other interesting mantras of the last decade was that technology had eliminated dry holes. Well, we never came close to obsoleting the dry hole. 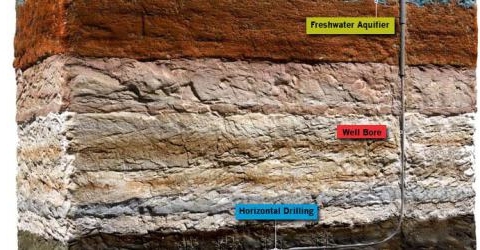 The reason dry holes dropped so much is we drill far less wells. We also stopped doing most genuine exploration. Even projects that are called Wildcats today probably 20 years ago were called modest step-outs. It turns out that now that we look back with good data it takes four straight dry holes, it is still a risky business. The U.S. statistics are appalling. Here basically is the table going back from 1973 to 2002 of U.S. exploratory success rates and their dry holes as a percentage, and this yellow one going through there is 67% meaning that two out of three of those failed. We modestly drop the line from about 75% down to 67% but two third failure rate, we’ve just killed building dry holes. The North Sea exploration, in appraisal statistics, is still basically about 25% chance of success. Angola, of the major Block 17’s has had a string of dry holes. Eastern Canada’s recent statistics have been troublesome. The Caspian Sea, other than one great discovery, potentially has been bad. And even the Middle East is starting to dig a remarkable string of dry holes. The single biggest reason that this supply surge that so many people assumed was happening for so long was that depletion became the missing link. The reason supply flattened out or peaked was not the lack of effort and no new technology. The industry, in fact, had many great successes over the last decade. But they were not about to offset depletion. Oilfield technology created not an easy way to grow supply but a depletion rat race. Smaller new fields were found, technology allowed them to be commercial but we raised the climb rate to an amazing level, and therefore it began to flatten out. Why is oil depletion so hard to grasp? Well, the definition by itself is hard. Many would hear the term depletion and assume it meant that we ran out, and we obviously never ran out of oil. Depletion data was sketchy at best. It’s amazing how hard it is to dig out statistics for, even on a field by field basis, what the net decline is. And the elusive data that you can find is not real depletion but it’s the net decline after lots of additional drilling and money is spent to take a natural decline rate that would have been far more drastic if you flattened out. And finally, no one likes to discuss it much because it should mean bad news. Forecasting next year’s decline remains an art form. I don’t think anyone has ever been very good at predicting bad news. There are many ways also to slow natural decline, but it takes money and effort, and it’s only when you look back after these remediation efforts have been made that it creates real depletion answers. But let me tell you that as you all know, wells, fields, and basins do deplete. Our firm a year ago conducted a very intensive analysis of what was happening to the natural gas supply in Texas by examining the detailed records of the Texas Drill Commission from 50% of the state’s production in 53 counties. What we found was amazing. What we found was that in this 53 county area (this is 16% of the U.S. gas supply) the wells drilled in 2001, 2400 wells out of 37,000 wells that are in production created 30% of the total supply, and it turns out that 7% of these 2400 wells, 167 wells, created 49% of the supply and the other 93% of the wells created the remaining 51%. Those big 167 gas wells – a year later, we went back and tested their January 03 production; they had suffered a decline across the board of an average of 82% in a year, so wells do decline these days rapidly. The Cruz Beana field in Columbia, the biggest find in the Western Hemisphere since Prudhoe Bay, in 1991-92 it was still estimated that it could exceed Prudhoe Bay or Hatchet. But it turns out that this field just barely gets 500,000 barrels a day. And in 2002 it’s struggling to stay above 200,000 barrels a day. The Forty Field, which BP just recently sold to Apache peaked at approximately 500,000 barrels a day in the middle eighties, and the oil production is now under 50,000 barrels a day. It still produces about 500,000 barrels a day of fluid, but the balance is processed water. And then you finally have the interesting graph, that’s in the papers that I think you should have the last two Super Giant fields ever found. Ironically these two fields, Prudhoe Bay and Samotlor, were both found in about the same crust underneath of the Arctic Ocean. They were just found on two sides of the earth. Both were found within twelve months of one another, ’68 and 1967; both were presumed to have 15 to 20 billion barrels of oil. It’s interesting to see that Prudhoe Bay, says Platt’s Oil reservoir management, they choked off the field at 1.5 million barrels a day and for over 11 and almost 12 years, like clockwork, it produced 1.5 million barrels a day without missing a beat. But in late 1989 the field rolled over and is now producing about 350,000 barrels a day. Samotlor [Russia] had just the opposite experience. They started aggressively water-flooding a very wide field, and it produced peak production at about 3 and a half million barrels a day and then came off like a waterfall and is again down to 325,000 to 350,000 barrels a day. And so when large fields do peak they also do decline. There’s no question that when you take 50% of a remaining resource, you tend to alter peak. What’s hard is to obtain the right data to know whether you’ve reached fifty percent. And it’s basically that you’re looking back through events with hindsight. It turns out that total energy resources, uh, is still a mystery. And a recoverable percentage of resources is also largely a function of cost. The higher the cost, the more you can extend, recovering more and more of the harder and harder to get resources. And it’s also interesting when I think back on this that the technology to gauge resources, absent of seismic, is still effectively 100 years old. We have no better technology today to know how much resources are there before seismic is done than we had 100 years ago. And even after a few of them test their research you still leave many questions, and so it’s based on opinions. Let me give you some interesting examples of the uncertainness of this data. 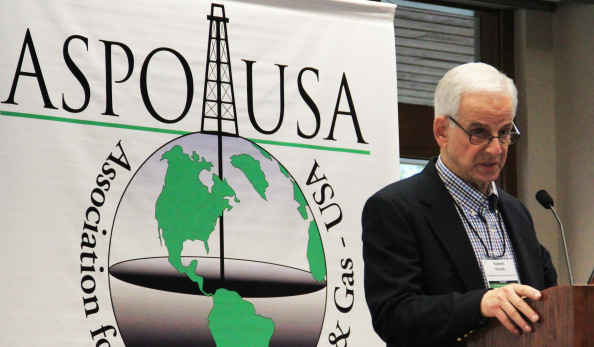 I attended a Natural Gas Workshop in Washington, D.C. about three weeks ago and the head of the U.S.G.S. made an interesting presentation about how hard it is to get experts all on the same page even when you have a complete set of data. One of his examples was the [unintelligible] basin in Argentina. Two hundred and nineteen mature fields. They had a data set that allowed all of the experts to use any one of the seven conventional methodologies to say how many remaining resources are there. And after a weekend of study, the estimates came back with a low of 600 million barrels to recover to a high of 17 billion barrels. It is a mature field area with 219 individual fields. Canada’s recent experience in Sable Island is a classic example of how little you sometimes know even after the fields have been in mature stages of production. It turns out that Sable Island looked like a fabulous project through wells one through five, and then six was drilled, and they found it was little, they miscalculated some reserves and so thirty-seven percent of the proven reserves of Sable Island in the last few months were written off. The Leaden Field, which is the largest project in U.K. sector of the North Sea last year; six months into its production the company had new data that highlighted the reserves, the reservoirs complexity so that half the reserves were transferred from proven into probable. And then another interesting presentation in the natural gas workshop in Washington was on center basin gas which pipes gas in the Green River basin where some new evidence would indicate that we’ve overstated potential recoverable reserves by three to five times. All of which highlights how difficult it is to get your hands around how much is left until you’re looking back at events with hindsight. Hindsight turns out to be a wonderful, unreliable tool. Some events are unpredictable until after the fact. Some of the classic unpredictable events turn out to be weather, death, one’s peak net worth and maybe the future of anything important. It turns out that peaking even for an individual well is only proven after the fact. And predicting peaking of energy has been an elusive art form for a long period. So back to the United States of America and our experiences in oil as a classic example of how hard it is to predict peaks. In 1956 Dr. Hubbert predicted in the early seventies. In the early seventies, the United States would peak. In 1970 it was obvious, he was wrong when the U.S. set a new record, the new U.S. peak. In 1981, what had been 9.6 million barrels by, at its peak was already down to 6.9 million barrels a day after a record drilling boom. And by 2003 this 9.6 billion barrel basin in 1970 is now close to 3 million barrels a day. The U.S. was Saudi Arabia in 1956. We had great statistics, we had total transparency, and yet only one person predicted the peaking in 1970. Did the United States get a lot smarter? Well the U.S. Natural Gas experience is a great new case study. In 1999 the Natural Petroleum Council projected that supply growth in natural gas would be adequate to increase gas use by 36% by 2010. 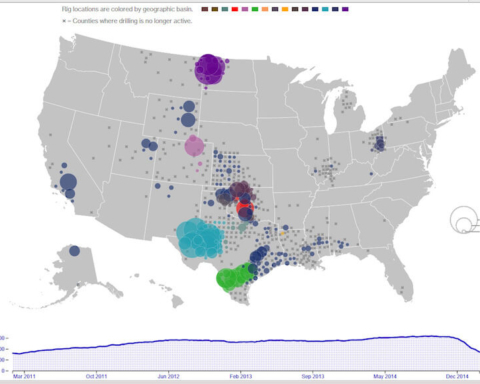 In 2001 we had a record drilling boom for Natural Gas. This failed to budge supply. In 2003 natural gas clearly, faces a crisis. The United States and Canada are in decline. What we all missed in 1999 was that no one could come to subtract unconventional supply growth, coal bed methanes, tar sands, deep water associated gas, and these giant gas wells down to 18 to 20 thousand feet vertical, from the conventional base, and discovered conventional base at about fifty feet… (unintelligible) [p]eaked through Europe in the nineties and is now approximately 35 BCF (Billions of Cubic Feet) a day. So it turns out the United States gas experience, uh, has experienced about the same phenomena that oil did 30 years ago. The North Sea experience is interesting. The North Sea had all the worlds’ best operators, state of the art technology. Its peak was assumed to be years away in 1996 and 97. In 1999 the U.K. Sector peaked. In 2002 the New Eastern sector peaked. The North Sea has the world’s best field by field production data. Seeing peaking is easier in the North Sea than anywhere else, but few people seem to study the data. Peaking, it turns out, even in the North Sea is easy to ignore. And then there’s the experience of the Caspian Sea. In the early nineties, the Caspian seemed to be the next Middle East. In 2001 we had 20 out of 25 dry holes that dampened the enthusiasm for the Caspian significantly. In 2001 Kashagan was finally discovered, deemed to be the greatest field in the decade. In 2002 BP and Stat Oil quietly sold their 14% of Kashagan for 800 million dollars. In 2003 British Gas put their 17% on the block for 1.2 billion dollars. Which raises, in my opinion, the question, “What do these original parties know about the world’s greatest field or do they merely want to spread the wealth? I think what this all means is that non-OPEC oil, particularly outside the Soviet Union, is either peaking as we speak, or has already peaked. Any serious analysis now shows solid evidence that the non-F.S.U. non-OPEC oil has certainly petered out and has probably peaked. F.S.U.’s supply is suspect or should be. A new frontier is always a possibility, but it is becoming increasingly unlikely now that deep water is here and come and gone. And serious energy planners need to assume non-OPEC supply is at a plateau. But thank heavens for the Middle East. The big non-Middle East OPEC producers are also past the peak. Algeria and Libya could probably still grow, but they’re too small to offset everyone else. And only the Middle East can logically be explained to replace declines elsewhere. The Middle East’s transparency is an oxymoron, but some data shed some light. And so let’s spend a few minutes looking at the Middle East, the Promised Land. Middle East energy is the Promised Land. All roads the roads lead to Rome and to the future of oil and gas Rome is the Middle East. The Middle East is where we still have abundant reserves. It’s still cheap to produce; it’s still remarkably unexplored. So if the rest the world is long in the tooth thank Allah for Mecca. But are we so sure this is the truth? It turns out that the Middle East oil and gas so far is not all over the Middle East. The Middle East covers an enormous land mass, but all of the oil and gas as we know it today is compressed into an interesting golden triangle. And all the great finds happened years ago. In the past three decades, exploration success has been modest in the Middle East abyss. Is this because no one looked very hard or because there’s not much else to find? Here is the interesting golden triangle of the Middle East; If you start at Kirkuk in the north and you draw a line down through the great oil fields of Iran, going down south and come over six or seven hundred miles picking up the great fields of the UAE and come back up 800 miles to Kirkuk virtually every field of any size between 1909 and the late sixties is probably in that basin. It turns out that Saudi Arabia has what they thought was a fabulous discovery outside that in 1989. By 2003 one field and five satellites needed gas injected to create flows to get about 200,000 barrels a day. So it’s also interesting to take the United States and superimpose this same golden triangle on the part of the United States on the part of the United States I grew up in. It covers most of Arizona and part of Utah, so it’s not a huge area. So if all roads lead to Rome then one area, Saudi Arabia, is clearly home port. Saudi Arabia became the most significant oil exporter once the U.S. peaked. Though also not trusted, Saudi Arabia has consistently tried to become the world’s most trusted supplier of oil, and they have done that. Saudi Arabia has assumed a virtually limitless amount of cheap oil. But let me tell you about some of Saudi Arabia’s oil and gas challenges. In Saudi Arabia, there have been no major exploration successes since the late sixties. Almost all of Saudi’s production comes from a handful of old fields. Almost every field has high and rising water pressure. Ghawar, the world’s largest field injects seven million barrels a day of seawater to prop up reservoir pressure. And outside North Core hundred barrel [unintelligible] have been very hard to find. Some key fields have never worked out. Others have now watered out. And it takes utter logic to plan for Saudi Arabia’s future. What Saudi Arabia’s real energy costs might be is that Saudi Arabia is probably no longer a low-cost producer. Lifting costs, plus, may now rise exponentially. Natural gas parting costs are extremely high and have been elusive. But what is Saudi Arabia’s right price for oil? I would argue that no one knows because we lack the data. But it turns out with a little bit of hindsight that the optimists turned out to be wrong. While the optimist’s estimate, the economist rectifies, the debate still rages on; the jury has now rendered the verdict. The optimists have lost. Too much field data now proves their entire thesis was wrong. Supply never surged, demand did grow. But as it grows it still falls. It doesn’t prove though that the pessimists were right. The pessimists unfortunately and ironically might also be wrong. Most serious scientists worry that the world will peak in oil supply. But most assume that this day of reckoning is still years away. Many also assume that non-conventional oil will carry us through several additional decades. They were right to ring the alarm bell. But they too might also be too optimistic. Non-conventional oil, unfortunately, is too non-conventional. Light oil is easy to produce and convert into usable energy. 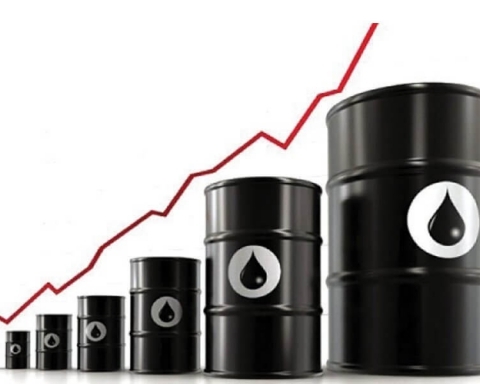 Heavy oil is hard to produce and extremely energy intensive and very hard to grow rapidly. It turns out the United States of America has nine fields left that still produce over 100,000 barrels a day. And three of the nine have turned out to be located in California and on average are 103 years old. The reason these fields are still there is that they’re very heavy oil. And heavy oil can last forever, but it’s very hard to get out of the ground. And it takes a remarkable amount of energy to convert heavy oil into usable energy. In 1957 the Sputnik woke up to the rest of the world. By 1969 we had a man on the moon. That was not easy, but the job got done. Could an energy Sputnik create a similar wake-up call? If we had such a wake-up call is it too late? Is there a Manhattan Project or an Apollo program that would work? It turns out that reliable energy is the world’s number one issue. Creating reliable and affordable energy opens the door to solving the problem of the world’s water, food, and healthcare. Without reliable energy all these other needs dull. The world is still growing. There five billion people on the earth today that are still either maturing in age or yet to be that old. And five billion people still use little or no energy. 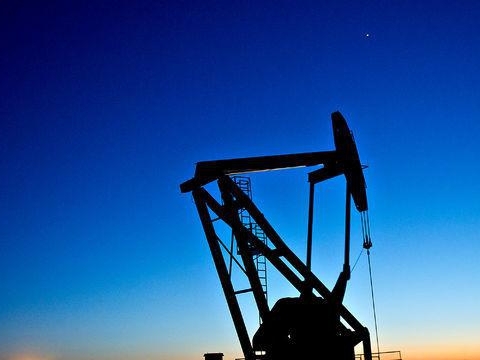 If the world’s oil supply does peak, the world’s issues start to look very different. Thank heaven the debate began even if it might have been too late. Thank you. I’d be happy to answer any questions. Q. Hi. I’m Steve Andrews. Given your message now and given that you’ve had a half hour in the Oval Office with President Bush, why is there such a disconnect between the apparent policy of the administration and the harsh reality of the message you just gave this audience? A. I think that there are people within the Bush Administration including the President and Vice President… I think it was unbelievably discouraging to see what occurred after the Bush Energy Plan was introduced. And then after 9/11, the administration got totally distracted in dealing with all the events that they’ve been dealing with since then. I will tell you that there is a growing genuine concern in Washington about what is happening with natural gas today. Q. I’ve been reading your papers for the last two years, and I want to congratulate you on excellent work, and in many cases, it’s work that I would have expected from a gas company, not from an investment banker. Last year, you defended the administration’s concept of depletion, and you show a real genuine concern for the future of the world and the hydrogen proposal is a fantasy, don’t you think it is time for a more liberal energy policy. A. That would be wonderful, but I think that it is going to take a while. There aren’t any good energy solutions for bridges, to buy some time, from oil and gas to the alternatives. The only alternative right now is to shrink our economies. It is a tough question, and I have no answers. Q. I know that you are on the books to bring back nuclear power back into the industry. A. Positive news. The Yucca Mountain is not complete. We have to figure out how to remove the nuclear waste. The bad news is that we have had one bad accident in Ohio and one in South Texas in which they found some borax acid that had become powder…is this a defect in the Westinghouse design. These are things which could set nuclear back 5 to 10 years. Q. Mike Ruppert, From The Wilderness — In the Baker Institute-CFR Report from April 2001, you were dissenting, and you called for a Manhattan Project-type investment, what would that entail? A. (More laughter) Those are pretty intelligent questions. What I encourage people to think about regarding energy blueprints is to think about them regarding the Marshall Plan. I still believe that there is an urgent need for an energy Marshall Plan. And couple that with a water energy program. I don’t know if you can draw any parallels that every place we have energy, we also have terrorism. Other than just musing about the fact that all the last twenty years while we have apparently benefited from these unbelievably low bargain basement prices, the prices were so low that none of the host nations were able to create any semblance of modern society. Over a 20-year period, all of their populations exploded, they all have a high birthrate, very young people, and terrible economies. Unfortunately, we ended up with the door prize that was so low that it was hard for them to maintain a company infrastructure and doing nothing to start rebuilding their societies. I suspect that had they been lucky enough to have had energy two or three times higher and then worked carefully with these producing countries to be enlightened about how, instead of putting in some young and influential leaders to start creating a middle class. And people would have begun focusing more on how to become more prosperous. I guess in hindsight that is easy to say. © Copyright 2003, From The Wilderness Publications, All Rights Reserved. May be reprinted, distributed or posted on an Internet web site for non-profit purposes only.